Newborn screening for inherited metabolic disorders dates to the early 1960s, when Dr. Robert Guthrie in Buffalo, New York developed the first screening test for phenylketonuria (or PKU), a metabolic disease in which patients can’t metabolize the amino acid phenylalanine. The so-called “Guthrie Test” was simple, inexpensive, and capable of screening entire populations of newborns prior to the onset of life-crippling disease. These attributes of the “Guthrie Test” have become the hallmarks of all newborn screening (NBS) tests. It is, in part, because of these required attributes, that tandem quadrupole mass spectrometry has been successfully applied to the field of newborn screening since the mid-1990s. Waters has played a part in the history of mass spectrometry-based newborn screening. In late 1994, Dr. Mike Morris began working with Dr. David Millington and Dr. Donald Chace at Duke University, who had been experimenting with the measurement of amino acids and acylcarnitines by Fast Atom Bombardment (FAB) mass spectrometry. In 2002, Dr. Chace was awarded the American Association for Clinical Chemistry (AACC) Sigi Ziering Award for Outstanding Contribution for a Publication in the Journal Clinical Chemistry for his work on acylcarnitine measurements in infants with unexplained cause of death. Dr. Millington has received a number of awards for his research including the International Society for Newborn Screening (ISNS) Robert Guthrie Award in 2006 and the inaugural MSACL Distinguished Contribution to Clinical Mass Spectrometry Award in 2015. The expansion of newborn screening to include a unified panel of 34 inherited disorders was so successful in the U.S. that the Centers for Disease Control and Prevention have called it one of the 10 greatest public health achievements of the first decade of the 21st century. This expansion of newborn screening could only be achieved using mass spectrometry technology because the technique provides a relatively simple, rapid, and inexpensive way to screen for such a large panel of inborn metabolic disorders in a single analysis. The analytical aspects of newborn screening for inherited metabolic disorders required special data reduction software. This need, first recognized by Dr. Morris, resulted in the development of the NeoLynx Application Manager at VG Biotech. This software module was developed in close interactions with thought leaders in the field at that time, including Duke University (Durham, NC), NeoGen (Pittsburgh, PA), the Institute of Child Health (London, UK), and King Faisal Specialist Hospital (Riyadh, Saudi Arabia). In 2001, NeoLynx received clearance to market by the U.S. FDA – another in a long line of firsts for mass spectrometry-based clinical diagnostics at Waters. The application of mass spectrometry to newborn screening accelerated quickly. The first newborn screening program that included the technique went live in Westmead, Sydney, Australia in early 1997. That was swiftly followed by the expansion of the U.S. newborn screening programs in New England (Boston) and North Carolina (Raleigh) in 1998 – all three labs using Waters tandem quadrupole MS technology. 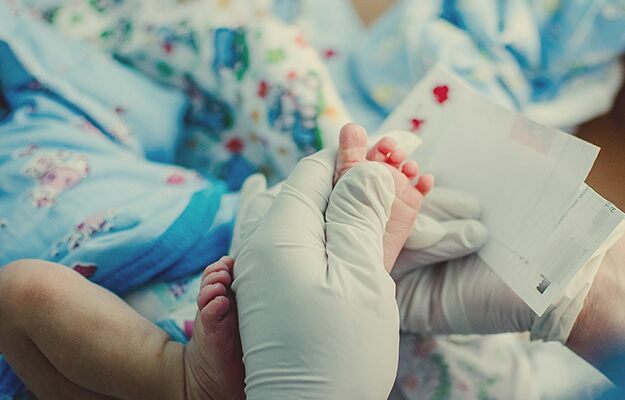 Today, mass spectrometry based newborn screening tests for more than 30 inherited metabolic disorders, is mandated in much of the developed world, and it is experiencing rapid growth in the countries of Asia. It has quickly become the standard of measurement for this very important public health function. In 2004, the state of California was preparing to expand its newborn screening program to include mass spectrometry. Due to the geographical size of the state and its large population of newborns, the decision was made to outfit multiple laboratories across the state with instrumentation. In order to maintain the consistency of screening results across multiple sites, the state decided to implement a kit-based approach and chose to work with PerkinElmer, the only company at the time to have newborn screening kits on market in the U.S. There was just one wrinkle. The public health lab leaders in California preferred to work with Waters’ mass spectrometry products. They challenged the two companies to work together to bring a solution to market. Thus, a 12+ year global partnership between Waters and PerkinElmer was born. Over these twelve years, hundreds of Waters mass spectrometry systems have been installed in NBS labs worldwide and thousands of babies have had their lives positively impacted by newborn screening. Waters is humbled to play a role in this initiative which has had such a positive impact on some many young lives. Special Section: Metabolism and Neural Function – Charles Roe – Honor Special Issue. Neuroscience Letters 637. (2017) 1-3. Ten Great Public Health Achievements – United States, 2001 – 2010. Morbidity and Mortality Weekly Report (MMWR). May 20, 2011; 60 (19); 619-623. Do you want to receive updates and info on this topic directly in your inbox?